Flat feet, or fallen arches, are the names given to a common foot condition in which the arch, or instep, of the foot is low or undeveloped and the foot presses flat against the ground. Flat feet are often a genetic condition, inherited from parents who also had flat feet, and it is usually not a problem. However, treatment for the condition may be necessary if you experience any of the problems listed below. An underlying problem with the foot, which could be related to the bones, muscles or soft tissues. If you are experiencing pain, your feet are weak, numb or stiff, or you feel that your feet are getting flatter, it is a good idea to visit your doctor. If your shoes are wearing out more quickly than you would expect, this could also be a sign that you may need treatment for flat feet. How Are Fallen Arches Treated? 1. Lose weight. If you are overweight, your feet will be under greater pressure and will be more susceptible to problems. Maintaining a healthy weight through a healthy diet and regular exercise will help you to keep your feet in great shape. 2. Wear supportive shoes. Wearing shoes with the correct support for your feet and your lifestyle can make a big difference if you are suffering with foot pain. Custom arch supports are often very helpful in treating fallen arches, and you can speak to the experts about these at Foot Solutions. 3. Look after your feet. Stretching the muscles and ligaments of your lower legs and feet is essential to maintain foot health, and the use of massage is also highly recommended to stimulate your feet and promote healing. 4. Consider surgery. Surgery is sometimes recommended if flat feet are a result of abnormally shaped bones in the foot, or if bones or tissues are joined incorrectly. Your doctor will be able to tell you whether this may be an option for you. 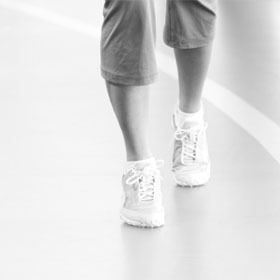 If you have flat feet or are experiencing foot pain, the friendly and helpful staff at Foot Solutions will be pleased to help you to find a solution that works for you. Custom arch supports can be created to fit your feet exactly, and will relieve the pain and discomfort you feel. Visit your local store today and give your feet a treat!